On Saturday we went to a family wedding and had to leave after three hours because Nino (who we’d left with his loving grandparents) had got himself hysterical and was refusing go to bed. He settled, of course, once we were home but this isolated incident sums up the last week or so of our lives – we’re discovering that life with an eight month old baby can be busy and hectic and hard. He’s crawling all over the flat and and attempting to walk, exploring everything and finding it frustrating when he can’t have/reach/walk unaided to what he wants. Sleeping, it seems, is cheating and some of the foods he found delicious a few weeks ago have become a bit of a battleground. That’s not to say he’s unhappy – for the most part he’s the same scrumptious, sunny baby he’s always been – but our little boy is learning to push boundaries, assert his preferences and establish himself as a voice to be reckoned with in our family of three. Last week one of my friends gave birth to a beautiful baby boy. I’m so excited that her genes (and her husband’s) are getting passed on to another brilliant human being – we grew up together and now Nino has a brand new next generation partner in crime. 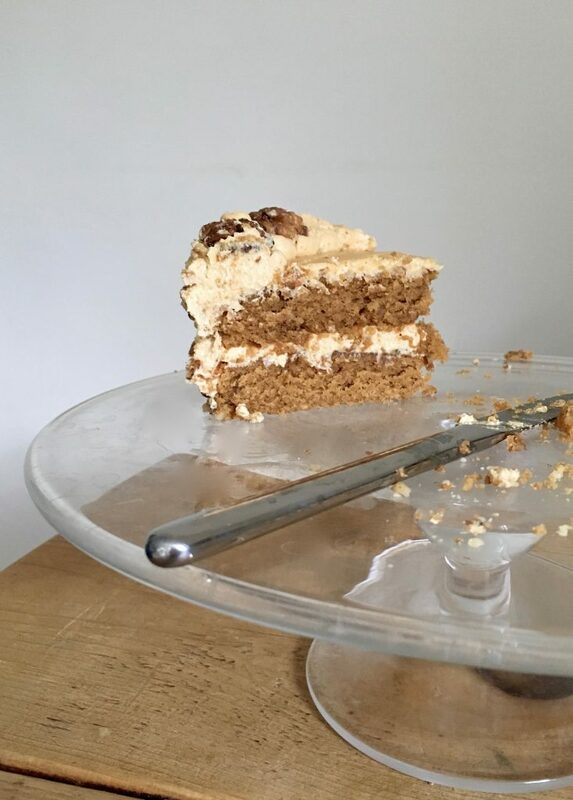 A week or so previously I threw her a baby shower with various treats including this, her favourite coffee and walnut cake. 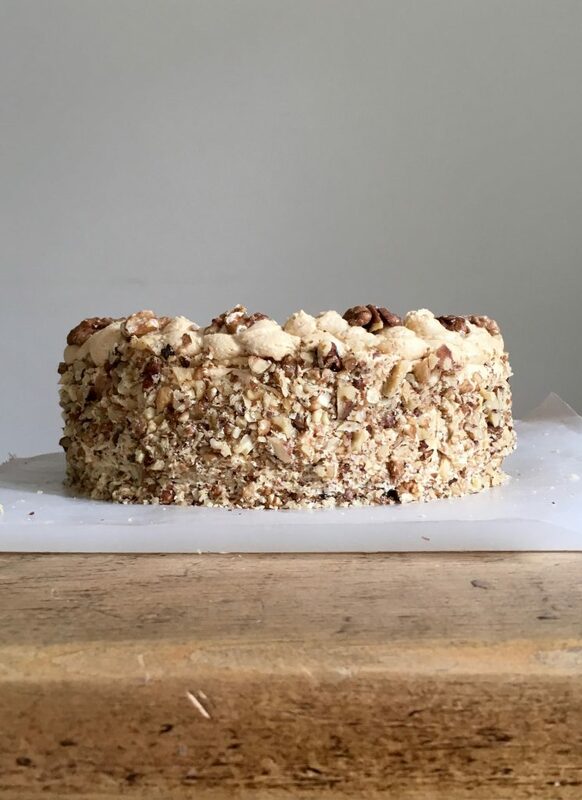 It’s simple and delicious with just the right balance of coffee, walnuts and a bit too much buttercream. Congratulations lovely lady and welcome to parenthood – it’s a rollercoaster of a ride but the very best thing you’ll ever do. 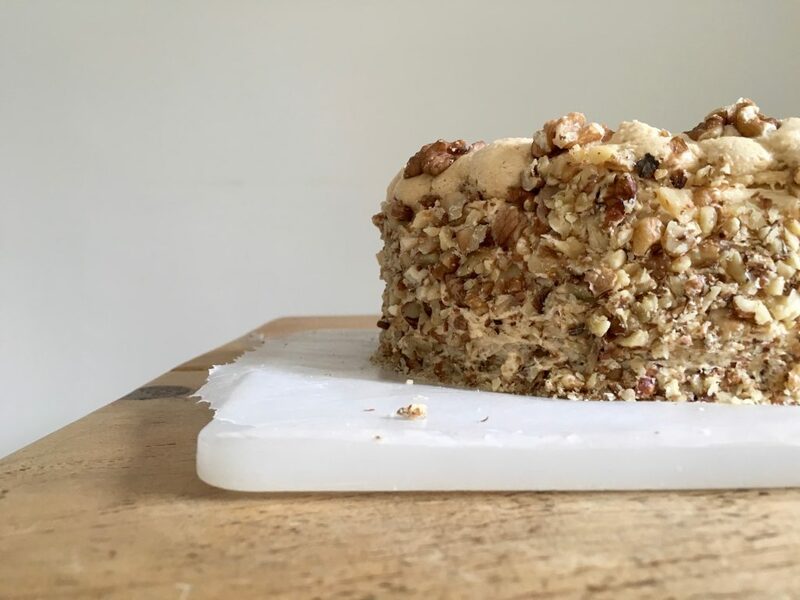 A moist, fluffy coffee and walnut sponge topped with thick swirls of coffee buttercream and crunchy walnuts. Preheat the oven to 180°C/fan 160°C/350°F/gas mark 4. Butter two 20cm round sandwich tins and line with baking parchment. Blitz 50g of the walnuts to a fine powder in a food processor. Separately chop 75g reserving the remaining 50g for garnish. In a stand mixer (or in a bowl with a hand-held electric whisk), cream together the butter, sugar and coffee until very light and fluffy, about five minutes). Add the eggs, a little at a time, then the 50g ground walnuts. Gently fold in the flour and 50g of the chopped walnuts, being careful not to over-mix. Divide between the tins and bake for 20 minutes, or until risen and a skewer comes out clean. Cool on a wire rack. To make the buttercream, in a stand mixer (or in a bowl with a hand-held electric whisk), beat the butter and icing sugar until light and fluffy. Beat in the cream cheese, vanilla extract and coffee then beat again until smooth. 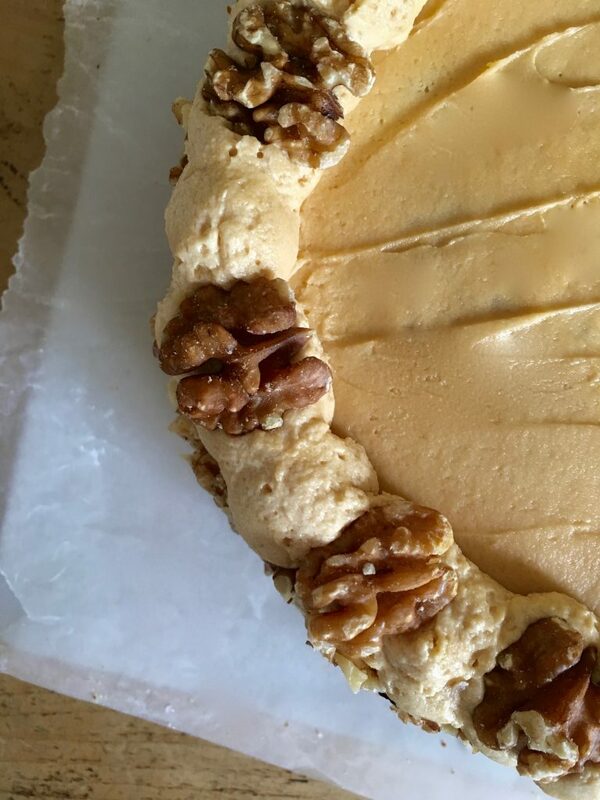 Use the buttercream to fill and cover the cake, then press the remaining chopped walnuts into the sides. 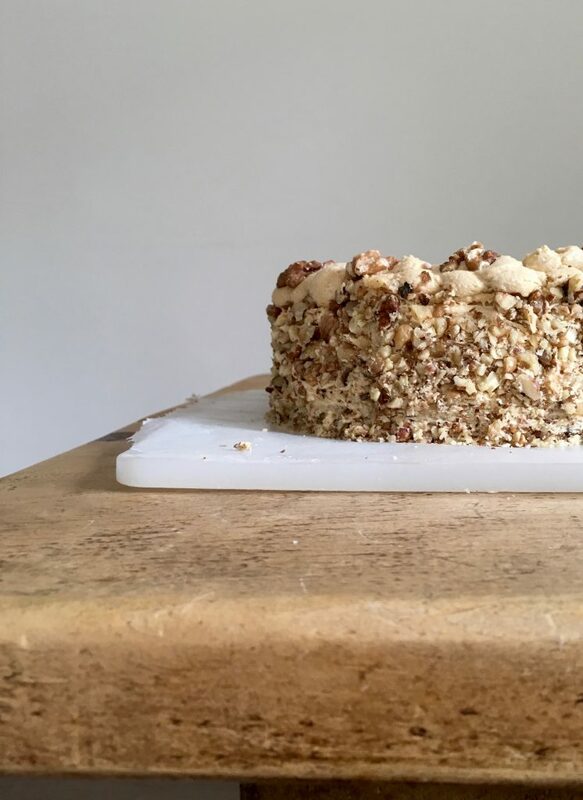 Decorate the top with whole walnut halves and serve in thick slices. Can’t wait to make this but the amount of cream cheese for the frosting is missing. 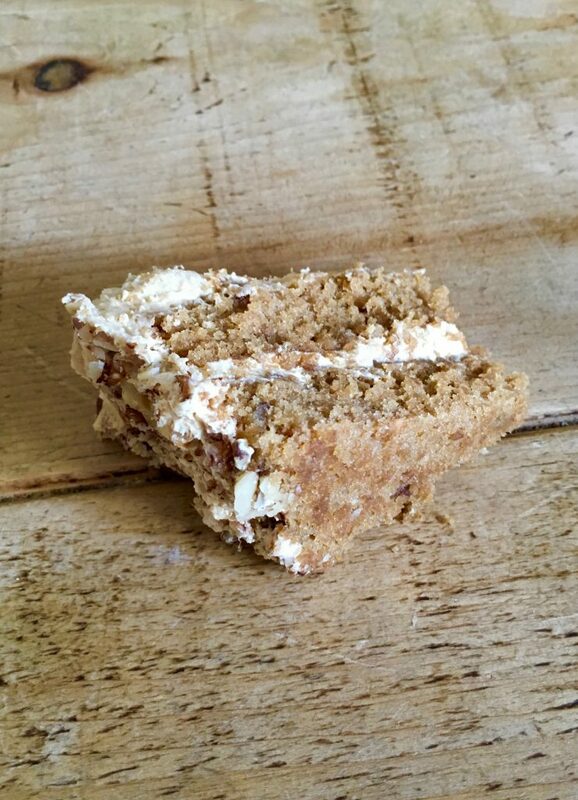 Your photography and recipes are fabulous !